What happened? Well, I’m trying to improve my resume. I wanted to learn Ruby on Rails. I was struggling to come up with a coding project for it until I had the brilliant idea of combining my projects. I’d make a character sheet generator. That project should be trivial, but enough to get my feet wet with RoR. But No Dice isn’t set in stone. I’d hate to spend all my evenings coding and then decide to add a fifth stat or that specialties could have their own scores or something. I had to make this thing generic enough that I as soon as I made those decisions I could just reconfigure the character sheet instead of writing new code. Essentially I was starting to make a generic character sheet for any system. That was not a getting your feet wet project. It hasn’t gone anywhere and I’m not sure it ever will. So why am I mentioning it here instead of on a coding blog? Well, this is something I’ve done on many occasions as GM. It’s not something I’ve done as game designer before, but I haven’t done that as much. Maps. These are the worst offender in terms of investment returns. I can spend ten hours painting a map that the players will look at for less than a minute. Minis. Hey look, it’s painting again. Music. My towns don’t need unique theme songs. My game does not benefit from me taking a break from GMing to queue up the next town’s song. Construx terrain. Actually a huge improvement over the cardboard stuff. 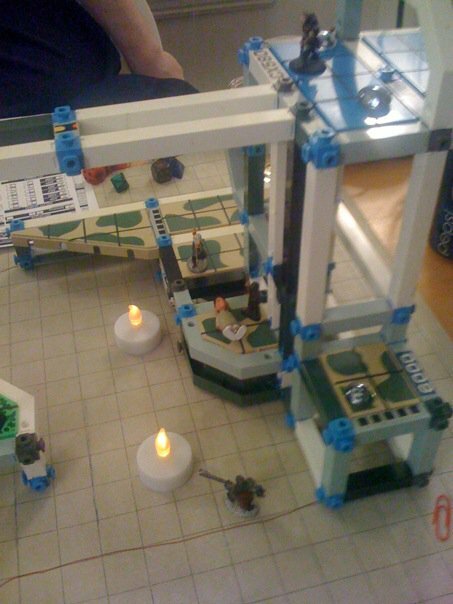 The danger with Construx was that I used them for all the fights. They should be reserved for fights where 3d terrain really matters. Two flavors of syntax highlighting for game text. In my defense, I did this at work. CharBuilder PDF margin fixer. Hey look, it’s coding again. Actually that’s not as much as I was expecting, but I’m probably forgetting a few. The point remains. These are things I put a lot of time into and added very little to the actual game. But an online character sheet builder for a system I haven’t finished writing and will probably never finish trumps them all.